Fear the primal force known as... GNOMELACTUS! I talked about Dave Dwonch's one-shot Gnome before. It's a fun read, and you should check it out when time and finance allow. Anyway, as a special promotion, he offered free sketches to anyone who ordered the book through DCBS. 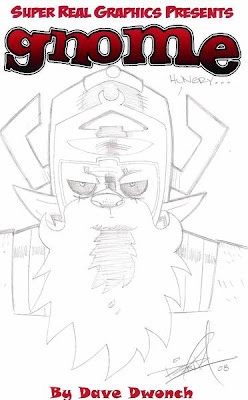 So you could get a sketch of the titular gnome, or any comic other comic character you wanted. As a gnome. And I have to say, I'm super happy with the result of my request here. That's a gnome I'd be proud to have in my garden. I'd probably keep him away from the veggies, though.